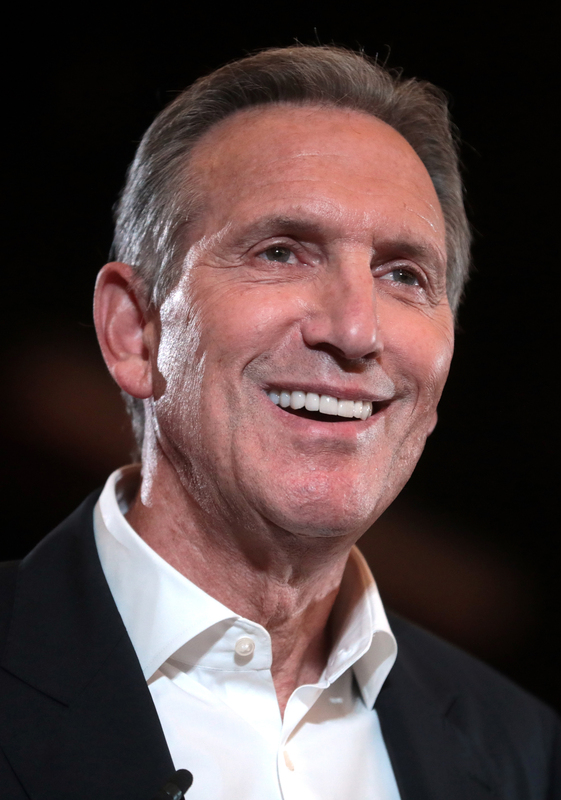 Tricia has a thoughtful and interesting post, The Buzz on Howard Schultz. She observes that our first temptation, to enjoy the infighting among the Democrats misses something important. Here are some of her observations. Schultz is considering a run as an independent, and the hysteria among Democrats is funny to watch. Yet as suggests the possibility that Trump might have to contend against a decent opponent is actually quite interesting. Will I support Schultz? I doubt I will. One reason is that I don’t have the problem with Trump that concerns some people. Consider my comment on “Trump’s temperament”. It is easy for the rest of us to criticize Trump, to complain that some of the things he does are beneath the dignity of the President. It is easy to forget that Trump represents the best among us, including the political class who leads us. In fact, many of our political leaders are angry with Trump BECAUSE he has succeeded where they have failed. If we want our leaders to aspire to higher standards, to behave with and to be deserving of greater dignity, first we ourselves must behave with and to be deserving of greater dignity. We cannot and will not elect better people if we do not become better ourselves. People with mullets are very angry. I don’t see much reason to converse with muckibr. He does not show any sign of understanding how foolishly he is behaving. I think he thinks politics is all about ridiculing and destroying the evil opposition. This will be my LAST comment to you Tommy, because you are beyond hope. And you may call yourself a Christian, but you are not a Christian. You need to read The Bible. Especially the Books of Matthew and Mark. p.s. Human RIGHTS are NOT the same thing as charity. That’s where you self-righteous fools always get it wrong. I found this comment in the spam queue. Apparently, you tried to send it about five times. Not sure why your comment got spammed, but given the character of the comments you have sent me, I expect lots of people put your comments in the spam bucket. You do realize the automatic system uses that information to figure out where your comments belong? Am I a Christian? That is not your decision. So what you think about it doesn’t matter. Is tithing required for Christians? The New Testament requires Christians to be charitable, to take joy in being charitable, to give until it hurts. It does not mention tithing, but some Christian Churches promote tithing. Is it that difficult to discern why? I am an anti-Semite? Because I don’t support tithing? Obviously, you lack good judgement. Ditto what you think of Donald Trump. Wisdom is not something we just have. We have to work to acquire it. We have to love our neighbor, and that requires effort. I suppose I should mention one other thing about tithing. You brought up tithing with respect to setting the tax rate, but it seems you want to change the subject and then run and hide. I think very very few Christian churches equate tithing to the church with paying taxes. Maybe you can find one. Shrug! Is Muckibr a play on MacGyver? But instead of throwing together some “muck” and coming up with something that actually works you just throw together muck that accomplishes nothing. You are aptly named. Do you prefer baby killers to liars and non-tithers? Or are you just the guy who likes to complain a lot and point without participating in the process? Lot of that going around. Muckibr seems to equate insults with constructive debate. Too typical these days. When we can define our “rights” based upon the notion government can give other people’s things for the sake of equality, we have already lost a great deal of respect for the individual. BTW, I am neither a Republican or a Democrat, because I am NOT conservative or liberal on all things. I am a TRUE INDEPENDENT and have voted FOR Republicans, Democrats and OTHERS in the past. That is why I can say, WITHOUT RESERVATION that Trump’s errors are not “unforced errors”. Trump’s errors are LIES. Trump is a LIAR, In FACT, after telling over EIGHT THOUSAND LIES just since he took the oath, it is conclusive to say that TRUMP IS A PATHOLOGICAL LIAR! Trump LIED about The Wall and that the Mexicans would pay for it. Trump lied about almost everything else in bewteen that and the Tax Cut he said was for the Middle Class, but was really FOR HIM AND HIS RICH PALS. And Trump has LIED about almost everything else since, including Michael Cohen and North Korea. Trump is a pathological liar, and the ONLY THING Schultz can hope to do is help that pathological liar, Trump, get re-elected when Trump should be serving time in prison, not The White House. Well, you are entitled to your opinion, but it lacks any factual support. An independent is just someone who doesn’t bother to participate in the nomination process. Therefore, when the general election came up during the last presidental election, the true independents showed their infinite wisdom by standing aside doing nothing to stop the two major parties from offering Trump and Clinton as the only viable candidates. Given the alternative, I voted for Trump. Third, for FACTUAL SUPPORT see https://muckibr.wordpress.com LOTS and LOTS of FACTS there. Fourth: By voting FOR Trump, and admitting it, you admit that YOU are part of “THE PROBLEM” whereas I am suggesting a “SOLUTION”. Thank you for less than nothing. First: The spell checker does not much care for your handle. I expect that is typical of spell checkers. Second: You said true independent. Perot might fit. Voting in PARTY primaries doesn’t. Primaries just corrupt political parties by allowing people to participate who shouldn’t. It is unfortunate, but we have let state governments take over the operation of political parties. Political parties are suppose to be private operations. Why? Look at the First Amendment. What do you think the fellow who wrote the First Amendment were thinking about when they included ” the right of the people peaceably to assemble, and to petition the Government for a redress of grievances”? Political parties run by state governments? Third: I am not going to read your whole blog. I don’t even expect anyone to read my whole blog, and I cannot imagine why anyone would not find it far more interesting. If you have a single, substantial and specific charge against Trump that you can prove, bring it forth. Otherwise, you are just wasting your time and mine. Fourth: I am perfectly happy to be part of “THE PROBLEM”. Your SOLUTION looks like abominable ignorance on crack. Schultz is what he is, an EBA (Egotistical Billionaire xxxhole) who is trying to help another EBA named Trump get re-elected. Why? Because Schultz LIKES the TAX BREAKS he got from EBA Trump and does NOT want to pay his fair share of taxes as proposed by AOC or Elizabeth Warren. SCHULTZ IS AN EBA! BOYCOTT STARBUCKS!!! NOTE FROM YOUR HOST: Foul language is not permitted here. Such language is hateful, not constructive. It is for the ignorant, not the wise. If you wish to post comments here, please do so without vulgarity. Fair share of taxes? What is a fair share of taxes? The ULTIMATE FAIR SHARE is TEN PERCENT, no exclusions, no deductions, no nothing, but a FLAT TAX on ALL PEOPLE. Rich people, like Trump and Howard Schultz, DO NOT PAY ANYTHING CLOSE TO THEIR “FAIR SHARE”. You know it. I know it. And God knows it! THAT IS A FACT! In fact UBER RICH AMERICANS pay nothing, and rich corporations end up paying nothing and demanding REFUNDS or FREE TAX PAYMENTS in return for paying nothing. That is also a FACT. A sad fact, but a FACT nonetheless. People receive their income from wages, capital gains and various sources. Does it make sense to tax all these things the same way? A flat tax on wages won’t affect the uber rich. There are also all kinds of taxes. That includes income taxes, property taxes, tariffs, and so forth. Revenues also have to match spending. Is ten percent of whatever too much or too little? The point is that ten percent is interesting proposition, but I don’t think you have thought this through. Melodramatic? No. Not at all. It is called “tithing”. As a member of the Religious Right I would have expected YOU to know about that. And, it would affect the Uber-Rich, as ALL INCOME REGARDLESS OF SOURCE would be subject to a FLAT TAX of whatever percent. (10% is what the Churches recommend. It could be scaled down for governments and would provide more than enough revenue for all governments in the U.S. if EVERYBODY PAID THEIR FAIR SHARE.) Yes, it does make sense. No other taxes. Just a simple, straightforward, honest and FAIR FLAT TAX that applies to ALL PEOPLE on ALL INCOME regardless of source. And I have thought it through. NO EXCEPTIONS. NO DEDUCTIONS. NO CREDITS. Just a straightforward FLAT TAX for all. Israelites paid the tithe to the temple, and they paid it more than once per year. The Kings of Israel did not collect tithes. Charity is suppose to be a function of the church, not the state. Anyway, I am not a Jew. Since I am a Christian, I am not under the Law. So I think we can come up with a tax scheme more appropriate to these time and to the government, not the church. Isn’t it funny how we deeply desire to see “our” traits in any of these people? Are we that narcissistic? I wrote about this from a different angle. Check it out when you get the chance. Interesting post you wrote. A bit too cynical perhaps. Depends upon how I want to interpret it, I suppose. Seeing our own traits in others is actually a good thing. We are each made in the image of God. We have more in common than we have differences. What we have in common is what makes it necessary and possible for us to work together. If we cannot sabotage the system, then the system will continue to sabotage us. It is important that we define what we mean by “the system”. Our Constitution defines “the system” we are supposed to have in D. C. If we need to sabotage anything, it is the people who constantly seek to corrupt our Constitution. That is quite a few of us, unfortunately. Politics is suppose to be a slugfest of words over ballots, not bullets. As citizens, our problem is to keep the government small enough that the slugfest remains a war of words over ballots. So long as our government is not terribly important, we can avoid civil war. When enough of us believe we cannot control our lives without controlling the government, bloody war then becomes all to likely. Exactly right @Citizen Tom, everything is so personal, that we lose control over candidates and representatives. We are too ready to fight in the streets over a person we hardly even know. I think that mindset fails to get a proper feel for the pulse of average American working class culture right now. We’re coming out of an incredible opioid epidemic, a horrendous economy, and constant political shaming while in the midst of our misery. For darn near a decade. So like, I’ll tell ya right now, Trumps tweets often offer up far more restraint and appeal to people’s delicate sensibilities than some of my own thoughts do. I think something still not understood,most of America is not worried about “future damage,” we ARE the damage, damage that remained invisible for far too long. When we select our leaders, we must choose from among the human beings willing to serve. That is probably just as well. If we were able to select from among the angels, we would probably choose fallen angels. It reminds me of that joke about how we’ve found the perfect leader, really good with money, walks with Jesus. I understand Trump’s appeal and ability to cut through the nonsense and do really believe he was the man for the job in 2016. I didn’t at first, but after watching the aftermath and paying close attention to the Trump supporters in my circle as well as how both political parties reacted to him convinced me he did what no other Republican could do. My complaints are not about his policies (except for trade), as a lot of his agenda is standard Republican fare. Even his obnoxiousness doesn’t bother me outside the fact that I would prefer a president more aligned with my own values in how I believe people should be treated. I can and do live with that more comfortably than I thought I could. What I can’t abide is the unnecessary handicapping this does to him and the Republican party which will hand a presidential victory over to the Democrats in 2020 and possibly the Senate. To win he’s got to grow beyond his base which so far he’s not been able to do. My point about Schultz was that even if he didn’t turn out to be my cup of tea, he would represent a sane candidate for Trump to contend with and it would make him a better candidate. He’d be forced debate a real person offering plausible solutions as opposed to the current crowd of looney cartoon character Socialists. Alas, I take heart that the D’s will surely nominate someone just as horrible or perhaps even worse than HRC. Much as I can’t stand Kamala Harris I’d like to see her get the nod, she’d be easy to beat. Wasn’t long ago I suspected Trump of being another Perot. History rhymes, and all that, so maybe it’s Schultz’s turn to be the new Perot. I hope not. Perot is what gave us the Clinton presidency. I think Trump has done a very good job (list available upon request) I don’t read his tweets. Sometimes I wish he would be more subtle, but that doesn’t seem to be the way of things in the world of social media. Expectations are that Schultz would take votes from the Democrats. However, if he gets on the ballot, the news media will try to change that. I’d be happy enough with Schultz if he won. But (as has been mentioned) he’s obviously not the officially anointed Democratic candidate. We’ve seen how this goes in the last election….superdelegates decide who gets the democratic nomination. I’d be happy if he took votes away from the Democrats as an independent, but I suspect it would be more like the situation with Perot. I suspect far more Republicans are independent thinkers who would steer away from the party line. The question to ponder is will Shultz steal votes from Democrats of Republicans? If you consider who will be hurt most when the USA becomes insolvent, who has more to lose? If the Democrats party represents taking from the rich to give to the poor, the debt issue is meaningless to Dem voters. Problem is all about having to pay interest on debt means less social services available to the poor. How will Schultz present that fact to the Democrats will be his greatest challenge if he runs on a platform to control debt, in my opinion. Hey Tom, thanks for linking to my post and continuing the conversation. I think it’s important for those of us on the Right to have open and frank discussions about the party, where it stands as a movement and whether Trump is helping or hindering it for 2020. “It’s not just Trump’s tweets Tom, it’s the deeply ingrained narcissism that causes him to react to the benefit of his ego rather than the situation at hand. Granted many times that action turns out to be a plus for the country, but many times it does not and in my opinion does damage to the societal glue and relations with foreign countries. This of course assumes Democrats are not stupid enough to nominate someone as unlikable as Hillary. It appears though they may very well make that same mistake based on their slew of candidates. He’s not done a good job of that these last two years which frankly frustrates me because it would have been so easy to keep going with the good policy while keeping his crazy side squelched. Think about the pressure Trump’s been under. If you look at the fellows who have occupied the White House, I suspect you won’t find any without some sort of problem.